Politicians should use the carrot and the stick, force energy saving in the short run and encourage innvation for the long term. A carbon tax putting a floor in the oil price or giving an advantage to low carbon products would be a long term incentive to innovation. Irrespective of our (somewhat inert) politicians companies are introducing low carbon policies. They do this because they know their clients want it. Research has shown that companies which focus on low carbon policies are better at innovation creating their own future. It is therefore not surprising that PPR, owner of luxury brands Gucci and Yves Saint Laurent, announced it would follow Puma’s lead and present a full Environmental Profit & Loss account by 2015. 1. Question: Innovation OR reduction? Any problem has two solutions. Forego the wanted-end-result and stop causing the unwanted effect or achieve the same end result without the unwanted effect. In other words stop doing what you did or find a new way of doing it. Apply this to climate change and it explains why we have two competing climate policies. 1. On the one hand governments (its environmental arm), our finance departments and most environmentalists encourage us to use less energy. Saving on energy consumption does indeed reduce our green house gas emissions but if it leads to less production it erodes the economic fundamentals of a company. Reduction also does not fundamentally change the process, it means that we still emit green house gasses, reduction therefore only delays a process it does not stop it. 2. On the other hand the same governments (its industry and trade arm) and marketing departments will urge us to innovate. Innovation will create lasting new solutions to the challenges offered by climate change. The problem with innovation is that its occurrence and its effect cannot be predicted and forced. It is more a belief that it will occur. This uncertainty makes it less popular with the profits of climate doom and the environmentalists. Answer: Innovation AND reduction! 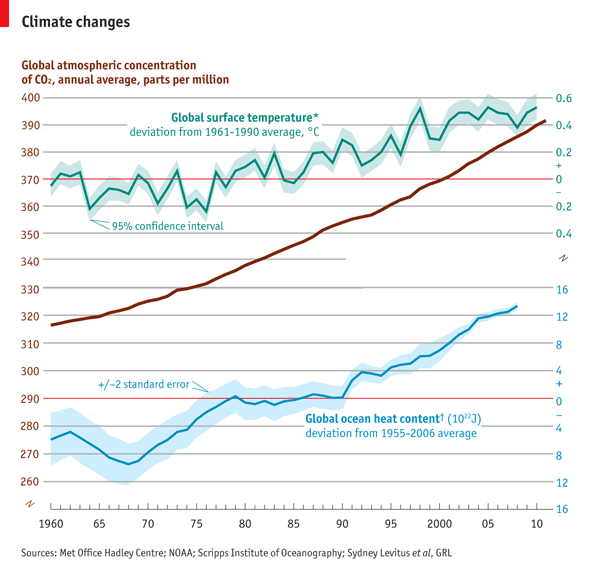 In the Harvard Business review of April 2012 these two approaches to climate change have been described and analysed. Roger Martin and Alison Kemper rightly conclude that to save our planet we will need both strategies. Innovation is obviously for the long term whereas reduction is to create a breathing space for a longer term solution. As both stratagies are necessary what should governments do? The answer form Martin and Kemper is clear: put a floor in the price of oil guaranteeing a long term outlook for new technologies. 2. Introduction of a carbon tax? William Nordhaus the famous Yale professor in Economics and the environment has termed the Kyoto’s mechanism “inefficient and ineffective” and urged their replacement with a global carbon tax that would force consumers and companies, not governments to innovate. A floor in the price of oil or a global carbon tax will encourage innovation and, for the short term, encourage energy saving.With governments running out of cash, continued subsidising clean technology is under threat, a tax on, for instance, the carbon footprint would be a sensible alternative. This would be in line with the suggestion of the ACEA to use tax incentives to encourage the purchase of cars with low CO2 emissions. It is clear though that climate change has created its own momentum. 1. Irrespective of direct government regulation companies are adapting low carbon policies. This is in line with the findings during the 2012 Davos World Economic Forum: Rising GHG emissions are the third most important topic according to the particiapants. (Severe income disparity and chronic fiscal imbalances came respectively first and second). 4. Focus on climate change makes companies perform better! A survey conducted by Xueming Luo, Professor of marketing at the University of Texas and published in HBR of April 2012 found that companies with a stronger than average focus (top third) on CSR brought out on average, 47 new products a year while companies in the bottom third brought out only 12. This effect is attributed to the fact a focus on CSR strengthens relationships with external stakeholders, including customers, suppliers, nonprofits, and governments. The focus on CSR provides access to a wide body of knowledge which help a company ton stay ahead of shifts in market preferences, incorporate new technologies and facilitates creative leaps. 5. PPR is not afraid to be transparant about its environmental policies. Already at the end of 2011 PPR announced that it would by 2015 provide a monetary valuation of the environmental impacts of its business operations and its supply chain. PPR expects, in line with the survey quoted above, that this approach will serve as a catalyst for the development of a truly sustainable business model.